As we reported in an earlier blog post, the Carr Center for Human Rights Policy in the United States has initiated a project to study mass atrocity response operations (MARO). These efforts seek to articulate a doctrine by which military forces all around the world would be able to plan and execute operations to prevent or stop acts of genocide and other mass atrocities. This concept is apparently gaining popularity within the Pentagon itself and, according to Wired magazine, consideration is now being given to how unmanned aerial vehicles (UAV) can be used to make this a reality. 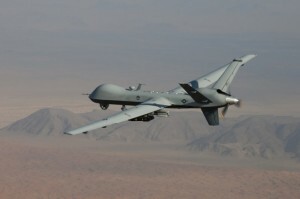 A Reaper UAV in flight. UAVs, commonly called “drones”, have some unique capabilities that make them useful for military operations as well as early warning and monitoring of genocide. First of all, they can provide nearly continuous and discrete surveillance of an area where genocidal forces may be operating. This can have several benefits, including informing intervening forces about areas where civilians are in imminent danger of attack. The images captured this way could also later be used as evidence in investigations and trials of the perpetrators, which has also given rise to the idea that the overt presence of UAVs may “shame” genocidal leaders into stopping their actions for fear of later prosecution by reminding them that they are being watched. A second major potential is the capability of UAVs to jam radio and cell phone signals, which can hamper the spread of hateful propaganda and interfere with the communications of genocidal forces. At this stage, the idea of using UAVs for genocide prevention remains just that – an idea. While military leaders may be interested in the potential, this still remains simply a tool which would only be used to carry out operations which must be initiated by political leaders. From a civil society perspective, the Genocide Intervention Network did investigate the possibility of leasing a UAV for use in Darfur in 2006, but found the cost to be prohibitive. Still, there is potential. As technology improves, capabilities that were formerly the exclusive domain of national militaries and large corporations will become increasingly accessible to anti-genocide organizations. Hopefully, this development will continue because it could give early warning systems such as that being developed by the Sentinel Project the kind of responsive, on-the-ground information gathering capabilities that we need to be truly effective.